The Monthly Mingle goes into it's fifth month and I am really so thankful to everyone who has taken part in this event. This time round I wanted to make it a little more challenging. Up till now I have given you a theme and you have picked your own ingredients, combined it in a recipe that fit the theme. Now, I thought I would pick 2 ingredients for you and you would use these in any type dish you would like to create. It is not easy picking two random ingredients to fit the lifestyle of all cuisines. Some of my dear readers are vegetarian, others eat fish but not lamb, some eat beef but not fish, so you see coming up with the theme for this Monthly Mingle was a little challenging for me too - LOL! I did come up with the ingredients though. I remember a dear reader (Anupama) once mentioned in this post that she normally uses Indian herbs and spices and was glad I had showed her a way to use a different type of herb and a recipe that goes along with it. The herb was Sage. That is the first ingredient on your list. Have you got that down? The next was actually a vegetable that was lying right in front of me all along. My mother-in-law plants these every year. We reap the fruits (or vegetables) of her harvest to such excess that by the end of the season I am lost for ideas and recipes and am happy that I can pass them on to my friends. 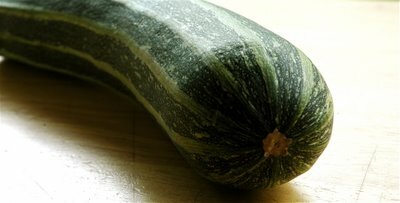 It is the zucchini (or squash). Put that on your list too. So, now with your first two ingredients already sorted all you have to do is list the rest and come up with something delicious for this months theme "Take Two". The deadline is October 12, 2006 and the round-up will follow on the weekend. Send your mails with the link to the recipe to blogmeeta@hotmail.com. I also designed the logo above especially for the MM. You are welcome to use this in your entries/posts. Sage and Zucchini.. hmmm.. you are really going to make us think.. arent you?? "Take two" is a great idea. Should be interesting. Ooohh ... a challenge ... I love it! Meeta, I am looking forward to this! Hi,Meeta..its difficult to get Zucchini here in Nasik...so is it ok if i use silk squash/ridge gourd to substitue zucchini?? ?